This is a photo of yesterday afternoon, still.. I have more, from today, but haven’t uploaded them yet. Not much time anymore! We had a rough night. Kajsa had a slight fever (still does), so finally some infant tylenol helped. She has cradle cap, so we’re working on that. And she has some heat rash. Some of the adults are almost getting heat rash here, because it’s so hot and humid, and the Air Conditioning Controls in the hotel rooms are just for kicks and looks.. we can adjust all we want, but nothing changes, really. It’s hot as anything in the rooms, and humid. Anyhow, Kajsa has taken lots of naps today, and one really long one. We finally woke her up, so she will hopefully sleep tonight. And she finally took a bottle of formula. Otherwise, she’s been living on cheerios (they have been a lifesaver!!! ), watermelon, and this morning she ate some bread pudding. Today we went to the Civil Affairs office again–this time to do the official registration, hand over the money (whew) and sign more paperwork. We had to wake Kajsa up for a family photo, and that was fun. Funny photo, poor kid. We spent a couple of hours at the CA office, hot and humid, as usual. After that we went to the police station, where individual photos were taken of each child, via a web cam. Pretty uneventful and fast-moving. Now we’re off to the notary office for some reason.. can’t remember. We were going to go this morning, but ran out of time. After that we are probably going to WalMart, Nanchang! Apparently we can get all kinds of useful stuff there, which we’re looking forward to. So, still happy. Still exhausted, but feeling a bit better after a nap for us adults as well. Still hot and humid. We continue to feel blessed, not only by having Kajsa, but also by your thoughts, prayers, support, comments, virtual hugs, etc… Thank you. We’re elated. And exhuasted. And hungry. We did it! 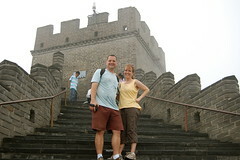 We climbed the Great Wall… no, not all 3,600 (more or less) miles. But the portion that we visited, we climbed. We were only going to do a few small parts of it, but then kept going. And it was fun. Hard to tell which was harder–Wayna Pichu in Peru, or Great Wall. The bummer of the day was that by the time we got to the Great Wall it was SO foggy, wet and cloudy. The quote of the day was overheard as we were descending. A man walking up in a group, almost to the top, said to his friends, “the steps are wet from sweat of people, not from the rain.” No kidding. Sweat, sweat, and more sweat.. This morning we visited Tiananmen Square. Chilling. Crowded. Modernized. Amazing. And the Forbidden City. Incredible. I wish our photos would do all three of these sites justice, but they just don’t. But I will post photos eventually. Tonight we re-packed our suitcases for tomorrow’s early plane flight to Nanchang, the capital city of Jiangxi Province. If the schedule is carried out as currently planned, we will be meeting Kajsa in about 16 hours. Can’t wait to share photos of Kajsa Ling Stanley-Erickson! Off to try and sleep. Dinner was phenomenal last night: Peking Duck. After some major confusion about the prices, it ended up being quite the deal. Phenomenal food… poor ducks.. Yesterday after the pandas at the zoo, (the only thing we saw at the zoo), we saw the Summer Palace, had a good lunch of Chinese food, and visited the Temple of Heaven. The few photos I’m posting on Flickr will have to do for now.. we’re having an electric challenge: when we leave the hotel room, we remove our key card from a certain slot, which turns the electricity off. Great for saving electricity. Not-so-great for those of us charging laptops, camera batteries, video-cam batteries, etc.. pretty funny. So, a few photos at a time, until we have the chunk of time to upload more and do it that way! This morning, there’s a strange sight in our hotel room: SUNSHINE!!!!!! Very strange. We haven’t seen this much sun since arriving in Beijing. yesterday several of us from our group commented about how frustrating it was that our photos are all so grey. Ugh. But also, we commented about how much hotter it would be, so it’s a toss up. 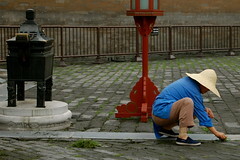 Well, today when we visit the Great Wall and the Forbidden City, we’ll be able to weigh which is worse! Maybe. The sun is shining, but still pretty faded, compared to a city which is not so hazy. Oh well. We’re loving Beijing (except the haze and humidity). Our adoption travel group is so fun. We have laughed a lot, and that has been good. Feeling blessed to be here, thanking God for the opportunity, finally, and grateful for all your prayers and support. A couple of notes: Joan and Dan, thanks for taking care of Abby! Sandie and Company, how’s Little E? Jo Ann, thanks for posting the comments that I can’t access! Jordan, we flew on a 747! It was huge! others… thanks for checking in..
That’s it. 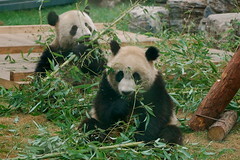 That’s all the photos of pandas at the Beijing Zoo that I have. Ok, admittedly, I’ve already deleted about 15-20… but still… I could have taken 500, they were so darn cute! Only problem? the glass in between s and the pandas was both dirty and foggy, so, not the greatest pics. Out to dinner–Peking Duck! Should be an experience. 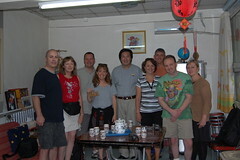 Yesterday morning we met our guide, Jerry, for the Hutong Tour, at 8:30 in the Hotel Lobby. 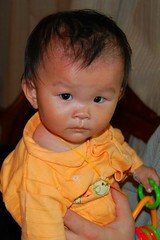 Jerry works for “Delight Travel”, a travel agency that Great Wall China Adoption utilizes for their adoption groups. We also met two more GWCA couples also adopting on this trip, ones I’ve been in touch with through the yahoo group. (plug: for anyone adopting from anywhere, get on a yahoo group.. if it doesn’t exist, create it!) We met a third couple the night before. Today we’ll meet even more. We got on a bus, with Jerry and some driver, and began riding through Beijing, passing bicycles upon bicycles, people out walking, busy streets, lots of businesses… busy Beijing. The most alarming thing to me about Beijing: the pollution! Unbelievable. Yesterday afternoon Jim and I saw the sun trying to shine through, but it was having a hard time through all the haze. Quite amazing. I’d heard about it, but seeing it? Wow… Apparently Beijing is going to limit auto traffic beginning July 20th (according to Jerry) before the Olympics… even numbered cars get to drive on even-numbered days; odd-numbered cars on odd-numbered days. 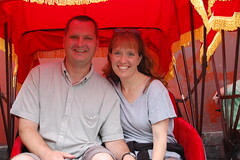 The rickshaw ride took us through the Hutong district of Beijing. The Hutong area of Beijing is like “Old Beijing”. Hutongs are old alleyways and courtyard homes, which used to be all over Beijing. Similar to a labyrinth, or paths connected to one another, the Hutongs form a quieter, somewhat-peaceful neighborhood to wander through. But wander with a guide, or a rickshaw.. I doubt I could have found my way out otherwise! We visited one man and his home.. his hutong. I can’t remember his name, but he was fun and funny. He served us tea, Hutong Grace translated his conversation about the Hutongs, and life there, and his daughter, who was at school. This man also works at the airport, fixing airplanes. We asked if he would be going to the Olympics, and he said not, it was more important for him to make sure the airplanes all work, and that he hoped to see some Olympics on TV. More later.. Check out more photos at my flickr site. You can link to it from the bar of 4 photos to the right of this blog. I have spent about 2 hours today trying to blog, trying to create new blogs, etc. nothing’s working. This is my second-to-last resort. My last resort is to contact JoAnn or Sue to post for us. Anyhow… aside from blogging woes, China is so fun! We’re exhausted, we’re thrilled, we’re travel-weary, we love it, we wish our hotel room AC was working a little better, we wish we didn’t have to tip so many people so frequently, (more about that later, probably), we can’t wait to meet Kajsa on Sunday.. we can’t believe we’re here in China! For the past year or two, I’ve been part of a yahoo group that consists of other adoptive parents from our adoption agency. Parents with the same LID (Log In Date) as us, and thus, traveling at the same time. So far we’ve met three other families. Fun. In many respects I feel as though I know them already. The night before we left, I never slept. I wasn’t ready, believe it or not. Jim only slept for 30-45 minutes. Poor Sandie was the one who came to pick us up and take us to the airport at the horrible hour of 3:30-4:00 a.m… Craziness. I haven’t pulled an all-nighter in about 10 years, I think! ok, there’s thunder and lightning outside our hotel. I’m going to log off and hopefully post later.